China’s steadfast construction of artificial islands on a series of disputed reefs in the South China Sea (SCS) has raised the concerns of a fresh “China threat” in the Asia Pacific – causing a new kind of security dilemma. With such a revisionist activity, China seems to concretize one of the vital Sea Lanes of Communications (SLCOs), giving a new form to China’s assertive behavior. Such an activity is motivated by China’s curious case of overlapped sovereignty. Wherein, it claims the disputed sea with reference to a “nine-dashed line” – claiming almost the entirety of the South China Sea, leaving no space for the others to exist. With the on going infrastructure buildup since mid-2014, China has been constructing new installations such as ports, fuel storage depots, air strips, barracks and radar sites – thereby, extending the range of its navy, air force, coast guards and fishing fleets. 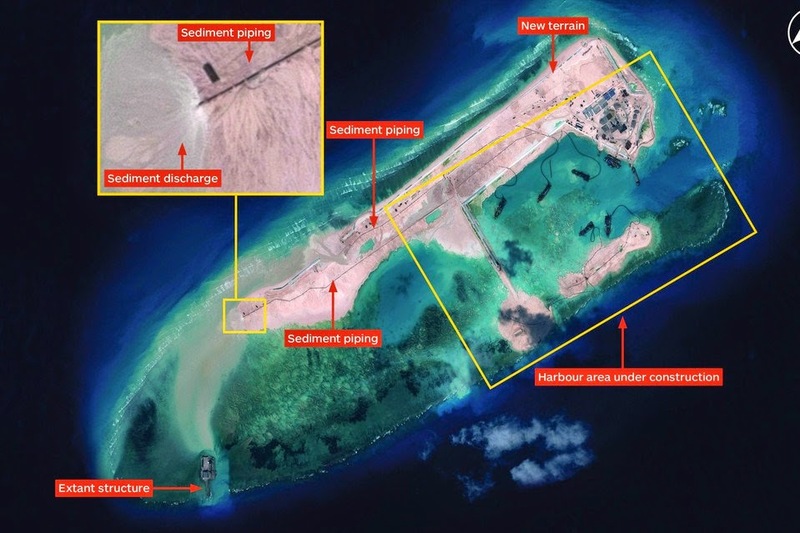 In validating its actions on a contested territory, China responded by rejecting the protests staged by Manila and Hanoi as well as United States criticism of reclamation, by justifying its activity to fall “within the scope of China’s sovereignty”. This Chinese behavior is representative of the fact that China does not want to conform to the international order presided by the Westphalian norms but rather seeks to change the rules of the order by its “Chinese Characteristics”. In this context, China’s such ambitious behavior can be attributed to be driven by strong realist motivations and interests. This can be explained as: on one hand, with its physical military presence, China benefits from the resource rich waters by exploiting the fisheries and hydrocarbon resources mainly oil and natural gas. To meet the increasing demand of fish consumption both domestically and internationally, SCS offers a cost-effective supply chain. And that being a net importer of oil and natural gas, SCS offers an advantage to fulfill its overarching energy needs as well as safeguarding the SLCOs from any bottlenecks, which is vital to its import-export trade and thereby, integral to its growth and development. While on the other hand, with such territorial control in the troubled waters, China gains the advantage to project its military power in the Asia Pacific region – posing a strong counterweight to the traditional balance of power mainly maintained by United States and its allies. It signals China’s military prowess and dexterous capability to counter any kind of security threat to its territorial sovereignty. 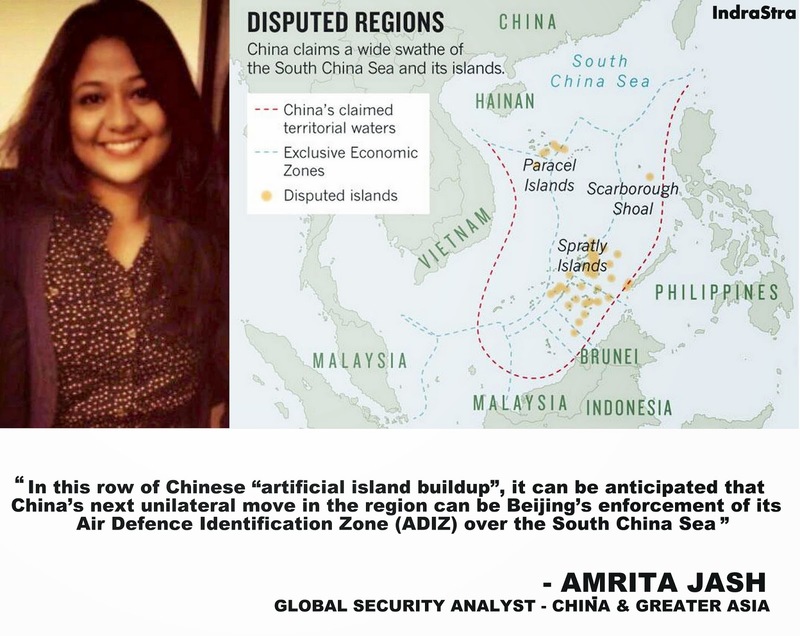 In this row of Chinese “artificial island buildup”, it can be anticipated that China’s next unilateral move in the region can be Beijing’s enforcement of its Air Defence Identification Zone (ADIZ) over the South China Sea – a similar compellence strategy as envisaged by the China over the Diaoyu/Senkaku Islands in the East China Sea to wade off Japan. In this context, with such power projection mechanism endorsed by China’s stationing of infrastructure capabilities elevates the nerves of the other claimants. Such an action oriented approach signals escalation of tensions in the international waters of the Asia Pacific. Whereby, China seems to be more aggressive in its claim of territorial sovereignty. Thereby, in this fall of events in the South China Sea, the reef frenzy raises security concerns not just for the countries concerned such as Philippines, Vietnam, Indonesia, Brunei and Malaysia – whose territorial claims overlap that of China’s, but is also indicative of China’s direct challenge to the United States’ “pivot to Asia” policy as enforced in 2010 to counter balance China’s “rise” in Asia as well as it strategically aims to evade Japan’s strengthened claims and actions over the Diaoyu/Senkaku Islands in the East China Sea. From the above assessment, it is agreeable that China is keen on changing the rules of the game. These Chinese activities clearly defy the existing status quo of the world order thereby, indicative of China’s keen interest to change the statutory norms of the international order. With such actions, it also clarifies China’s gradual departure from Deng Xiaoping’s old dictum of “Keeping a low profile”. For China thinks that the time is ripe to stick its neck out. It is clear from China’s such uncalled unilateral behaviour in the South China Sea which has readily elevated the anxiety level among the actors in the game. This is directive of the spiraling uncertainty which is resulting into grave concerns over China’s future intentions and motivations. Thereby, with increasing Chinese assertive behavior both literally and figuratively, it is hard to evade a military collision in the tensed bedrock of South China Sea in the near future.